With spring break quickly approaching, students should be aware of the ways they can have fun and enjoy their break while still remaining safe. 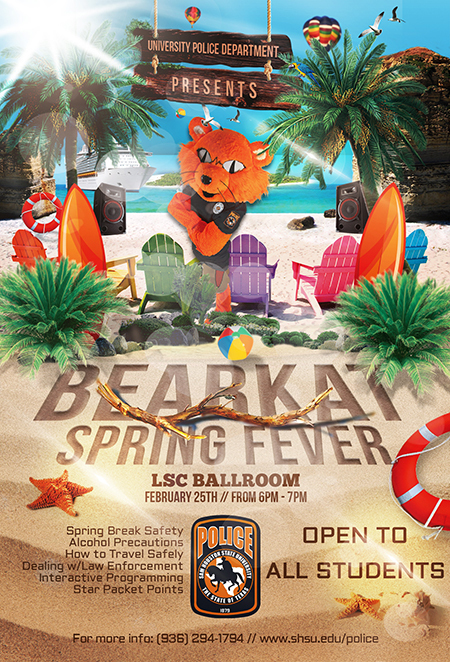 The SHSU Police Department will host “Bearkat Spring Fever,” a program designed to educate students and community members about spring break safety, on Wednesday (Feb. 25) at 6 p.m. The program, held in the Lowman Student Center Ballroom, is an attempt to create a fun, educational approach to the spring and summer semesters for the student community from a new perspective–of law enforcement, according to Jeff Butterworth, patrol officer and Community Outreach Efforts member. Admission is free, and all students are encouraged to participate. Greek organizations will be awarded star packet points for attending. For more information, contact Butterworth at 936.577.6150 or senior officer Kevin Hansford at 936.294.1794. Linda Johnson-Burgess will talk about her dissertation research in English, Africana Studies, and Women and Gender Studies on Tuesday (Feb. 17) at 5 p.m. in Academic Building IV Olson Auditorium. “She will discuss the fascinating concept of Africana womanhood, the idea that black feminine identity is primarily rooted in African studies and the African diaspora,” said Bernadette Pruitt, associate professor of history at SHSU. The lecture is sponsored by the departments of English and history. Admission to the lecture is free, and it is open to the public. For more information, contact Pruitt at 936.294.1491. Texas Game Warden Stephen Ingram will share his experiences on Thursday (Feb. 19) from 2-3 p.m. as part of the College of Criminal Justice’s Real Talk w/CJ series, in the Criminal Justice Center’s Hazel B. Kerper Courtroom. Ingram has protected the natural resources of Texas on land, water, and at the U.S.-Mexico border for eight years. 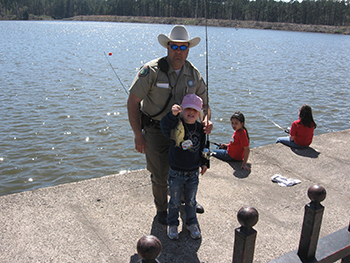 As a game warden with Texas Parks and Wildlife, he has the same powers of a state law enforcement officer, with the additional responsibilities of regulating hunting and fishing, and water safety. “There is no telling what I will come across; I have to deal with it,” said Ingram, who graduated with a master’s degree in criminal justice leadership and management from SHSU in 2012. In addition to enforcing hunting and fishing laws, game wardens now rotate in service on the U.S.-Mexico border, watching for human trafficking or drug smuggling into the country. For more information, contact Beth Kuhles, publications officer for the College of Criminal Justice, at 936.294.4425. More than 70 graduate students representing disciplines across campus will share the work they’ve been conducting as part of the 18th Annual Graduate Research Exchange, on Wednesday (Feb. 18). The event will be from 1-5 p.m. in the Lowman Student Center and will include 77 graduate student presentations—including three by video. “We are trying to meet the needs of our online graduate students by letting them submit videos in lieu of coming to campus to present,” said Weston Rose, media and communications specialist in the Office of Graduate Studies. An opening ceremony and welcome by graduate studies Dean Kandi Tayebi and a keynote address by SHSU Distinguished Professor of Counseling and Texas State System Regents’ Professor Richard E. Watts, will kick off the event from 1-1:30, followed by sessions from 1:45-4:15 p.m.
“Graduate students from the colleges of Sciences, Criminal Justice, Humanities and Social Sciences, Business, and Education will present on topics ranging from research on the Tawny Crazy Ant, to using 3-D printers to change lives, to the representation of gangs in print media, to the destructive powers of mining in Peru,” Rose said. Graduate Studies will award eight prizes, including four first place prizes for “Best Research,” “Best in Presentation,” “Most Creative Research,” and “Most Impactful Research;” and runners up in each category. Winners will receive iPad Airs and plaques. All presentations are free and open to the public on a come-and-go basis. For more information, contact Rose at 936.294.2359. The SHSU chapter of the Mu Tau Omega, the national organization for music therapy, will spread awareness about the issues and the benefits of music therapy with a weekend of lectures and performances on Friday and Saturday (Feb. 20-21) in the Gaertner Performing Arts Center Recital Hall. The theme for this year’s MTO Music Therapy Awareness Weekend is “May the Force Be With You” and includes five lectures presented by board-certified music therapists from across Texas. The entire event is planned, organized and hosted by the students of MTO, according to Karen Miller, professor and director of the music therapy program. That evening, music therapy students and faculty members will perform a MTO Coffeehouse Concert from 7:30-10 p.m. in Music Building Room 201. “The Coffeehouse event serves as the entertainment portion of the mini-conference and gives students, faculty, and guest artists an opportunity to perform in a relaxed atmosphere,” Miller said. Saturday’s activities include coffee and donuts from 8:30-9:15 a.m., followed by four lectures: “Music Therapy in Person Centered Psychiatric Care” by Michael Marcionetti, “Practice Makes Perfect: on Building a Successful Private Practice” by Kasey Cummings, “Music Therapy in Post-Traumatic Stress Disorder: Considerations with Vulnerable Populations” by Alissa Carver, and “Wise Words on Internships” by Grant Howarth, Michael Salinos, and Francisco Castillo. The MTO Awareness Weekend will wrap up by 3:30 p.m. on Saturday. For more information, contact Miller at 936.294.1376 or musictherapy@shsu.edu, or call the School of Music at 936.294.1360. Students looking to jumpstart the search for summer jobs or internships can learn about some opportunities in the great outdoors on Wednesday (Feb. 18) during Career Services’s Summer Camp Job Fair. Fifteen organizations will be available from 10 a.m. to 2 p.m. in the Lowman Student Center Mall Area to talk about summer employment in such areas as parks and camps, education, religion, and sports and recreation. Representatives will discuss positions at organizations such as Boy Scouts of America—Sam Houston Area Council; camps Balcones Springs, Olympia and Taconic; Glen Lake Camp and Retreat Center; Oscar Johnson Jr. Community Center; Cooper Farm; and Kidventure, among others. “Being a camp counselor for a summer is one of my favorite memories,” said Mitch Parker, marketing and events coordinator for Career Services. Students who are registered on Jobs for Kats can get a jumpstart on finding a job or internship by logging on, at JobsforKats.com, to find a complete list of participating agencies, as well as descriptions of positions being sought. All Career Services events are open to both students and alumni. Armonia Celeste, an ensemble that specializes in rarely heard repertoire from early Baroque and the Italian Renaissance, will bring their renowned show to Sam Houston State University on Tuesday (Feb. 17). The recital will begin at 7:30 p.m. in the Gaertner Performing Arts Center Recital Hall. Armonia Celeste consists of Sarah Griffiths, soprano; Rebecca Beasley, soprano; Dianna Grabowski, mezzo-soprano; Paula Fagerberg, Italian Baroque triple harp; and Lyle Nordstrom, lutes, theorbo and baroque guitar. Armonia Celeste came to fruition in 2008 when the musicians performed together at the Misio¬nes de Chiquitos International American Renaissance and Baroque Music Festival in Santa Cruz, Bolivia. The ensemble has since offered many concerts at locations throughout the United States, including Houston. Columbus, Ohio; Ann Arbor, Michigan; and Jackson, Mississippi, as well as several university and church concert series. The group also will lead a master class on Monday (Feb. 16) from 3-4:30 p.m. in the Gaertner Performing Arts Center Recital Hall. Admission to this class is free. The SHSU Department of Theatre and Musical Theatre will explore African American experience, race relations, and generational themes prevalent in the 1950s with its upcoming production. 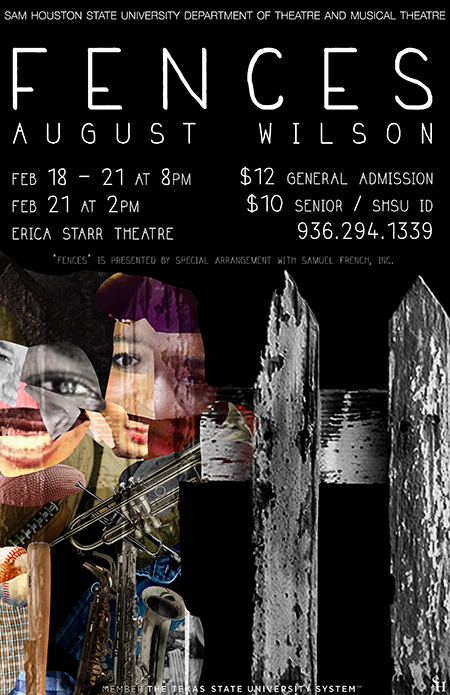 August Wilson’s “Fences” will be presented Wednesday through Saturday (Feb. 18-21) at 8 p.m. each day, and a 2 p.m. Saturday matinee, in the University Theatre Center’s Erica Starr Theatre. Winner of the 1987 Pulitzer Prize for Drama, “Fences” tells the story of a 53-year-old garbage collector named Troy and the struggles he faces providing for his family. Directed by Tom Prior, associate chair and associate professor of theatre, “Fences” stars senior musical theatre majors Andrew Carson and Maryann Williams as Troy and Rose. Other cast members include Camryn Nunley as Bono, Chris King as Lyons, Zach Willis as Gabrielle, Chris Akens as Cory, and Leinaya Gar as Raynelle. Designers include senior design majors Charly Topper (set) and Jennifer Sullivan (costume). Tickets are $12 for general admission and $10 for students and senior citizens and are available online at shsu.edu/academics/theatre/tickets. The SHSU School of Music will host a Wind Ensemble performance Thursday (Feb. 19) at 7:30 p.m. in the Gaertner Performing Arts Center Concert Hall. The ensemble consists of 68 woodwind, brass, percussion and piano students who auditioned for a place in the group. The program will feature icons of the wind band repertoire, including “Aegean Festival Overture” by Andreas Makris, “Fantasies on a Theme by Hadyn” by Norman Dello Joio, “Salvation is Created” by Pavel Tschesnokoff, and “Lincolnshire Posy” by Percy Grainger. The SHSU School of Music will hold a faculty concert given by Brandon Bell and guest artists Aaron Conitz and Francesca McNeely on Friday (Feb. 20) at 7:30 p.m. in the Gaertner Performing Arts Center Recital Hall. The recital will contain a number of works, including “Sonic Physiography of a Time-Stretched Glacier” by Mathew Burtner, “Violist and Percussionist” by Christian Wolff, and “500 Great Things About Wichita” by Chapman Welch. The recital will also feature the world premieres of “BRINK” by Asha Tamirisa and “Velvet, Black Velvet” by Mark Hirsch. Bell, lecturer of music and acting director of percussion studies, specializes in solo percussion and live electronics and recently received a 2014 Presser Graduate Music Award. “With two world premieres on the program, this is an exciting and rare opportunity to hear brand new music by two of America’s leading young electroacoustic composers,” Bell said.